3D screens without glasses show the 3D effect (depth of field, burst off-screen …) without wearing special glasses is necessary. 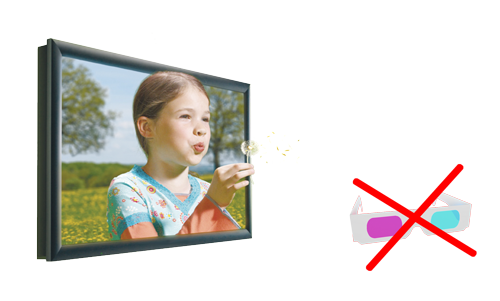 With the multi-view lenticular technology, the visual experience restores the depth of field and can be shared simultaneously by several personne without glasses. WoW 3D displays are based on a high definition LCD screen, creating beautiful images, restoring all the colors, brightness and contrast, in 2D and 3D. Indeed the 3D technology with glasses involves a considerable loss of brightness, contrast and degrades the colors.